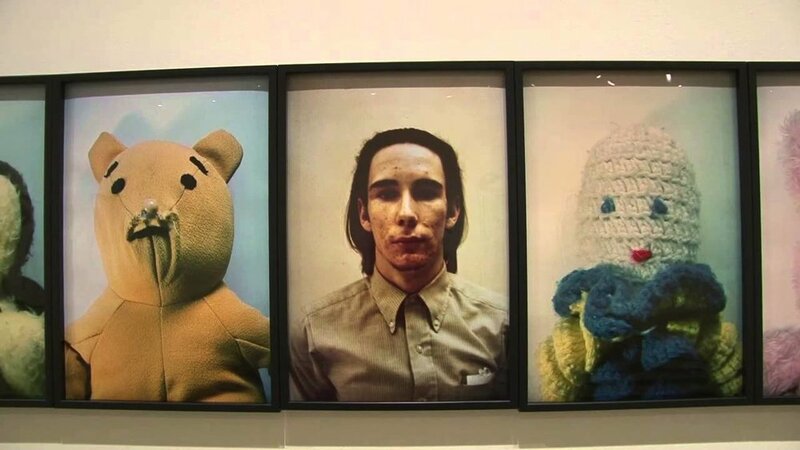 AS ONE OF THIS COUNTRY'S MOST PROMINENT VISUAL ARTISTS, Mike Kelley (1954-2012) twisted common colloquial forms—like signs, stuffed animals and felt banners — and infused them with the dark psychologies and hidden undercurrents (sexual, metaphysical, and otherwise) of middle-class American culture, assaulting everything that society held dear. From his first rambling performances in the early 1980s, he appealed to a cult audience because his work was too complex, aggressive, and willfully contradictory to be considered mainstream. Yet in the early '90s, his soft sculptures made from filthy thrift store animals garnered international art world attention, landing him a 1993 exhibition at the Whitney Museum (they also appear on the cover of Sonic Youth's classic Dirty album). Kelley had an even deeper background as a sound artist: He was co-founder of the seminal trash-noise collective Destroy All Monsters, whose anti-aesthetic marauded throughout the 1970s with a membership that included artist Jim Shaw, Ron Asheton (Iggy and the Stooges) and Mike Davis (MC5). “The first section of this text consists of edited brief descriptions of UFOs, focusing on the color of their illumination and their sound emissions, culled from the immense literature on the subject. These fragments were then rewritten into a kind of first person poetic reportage of a continuously present and endlessly morphing UFO sighting. The second section is made up of full quotations and introduces other common themes in Ufology. I read the first part of the text over the soundtrack (an eight channel overlay of various mechanic drones and ambiguous text clusters) composed for the sculpture "Silver Ball" (1994), with quotations from the second section acting as interruptions inserted throughout the talk. “The version released on record by Table of the Elements consists of a partial reading of the text that was used as one of the audio channels in the Silver Ball. This has been mixed with an ambient recording of the sculpture made at the Rooseum Center for Contemporary Art, Malmo, Sweden in 1997. The patches of digital distortion audible throughout the piece are on the original tape, which was purposely recorded too hot in order to produce a buzzing effect in the Silver Ball —which is basically a large hollow wad of aluminum foil, with speakers embedded in it, suspended from the ceiling."